This past weekend I experienced one of those moments as a parent when I felt so completely and utterly proud of my child. 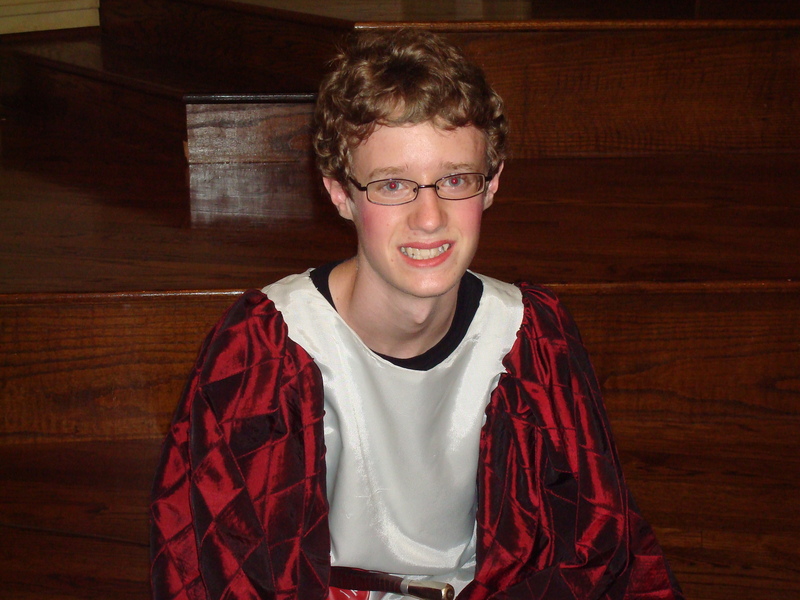 Last Thursday and Friday I watched Jacob perform the role of Romeo in his school’s Shakespeare play. I was struck by how nervous I was for him and the rest of the cast. The Thursday performance was for the school so I knew he wanted to do well in front of his fellow schoolmates. He may have missed a line or two, but I certainly couldn’t tell. Friday’s performance was for parents, the public, etc… and was even more moving as the lighting was more powerful since it was dark outside. What I wasn’t prepared for was how moved I felt watching my child perform this role in light of the storyline of Romeo and Juliet. On a lighter note, Jacob also got to have his grandparents present for his performance along with his youth pastor and a few members of his youth group. I think he felt the sense of accomplishment that comes when you have worked hard at something, and now get to reap the benefits. I certainly felt the parental pride flowing through my veins!